Healthy Emory’s “Know Your Numbers” screenings, held at 85 onsite events at Emory Healthcare and Emory University earlier this year, provided over 7,300 Emory employees with important information about their health and well-being. The screenings, which measured key biometric numbers including blood pressure, cholesterol, glucose, and body mass index (BMI) and body composition, also served as a springboard to action for employees. 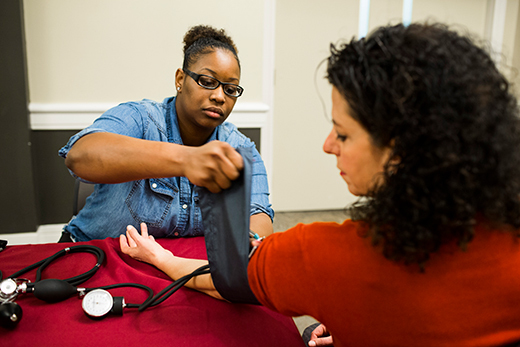 Since then over 500 additional employees have completed their screenings with their doctor, CVS MinuteClinic or Emory Employee Health Services. “We were very pleased with this year’s screenings, not only with the high participation numbers, but also with our employees’ feedback about the events," says Michael Staufacker, director of health management. "Our exit surveys showed that 96 percent were satisfied with their experience, but more importantly, 84 percent reported increased knowledge and motivation to take action to improve their health. Total Cholesterol: 67 percent of employees were at low risk; 33 percent were at moderate or high risk. HDL Cholesterol: 48 percent of employees were at low risk; 52 percent were at moderate or high risk. Total Cholesterol/HDL Cholesterol Ratio: 65 percent of employees where at low risk; 35 percent were at high or moderate risk. Glucose: 93 percent of employees were in the normal range; 7 percent were in the range of possible pre-diabetes or diabetes. Blood Pressure: 59 percent of employees were in the normal range; 36 percent were in the pre-hypertensive range; and 5 percent were in the hypertensive range. Body Mass Index (BMI): 36 percent were in the normal range; 33 percent were in the overweight range; and 32 percent were in the obese range. Body Composition: 37 percent were in the optimal range; 36 percent were in the moderate risk range; and 28 percent were in the high-risk range. 2017 is the fifth year that Emory has offered an online health risk assessment (HRA) on Aetna’s website for employees. This assessment (in addition to biometric screenings) also helps build employee awareness and can be the starting point for healthy behavior change. The percentage of employees consuming five or more servings of vegetables and fruits a day increased from 14 percent in 2014 to 32 percent in 2016. The percentage of employees consuming a lower fat diet increased from 48 percent in 2014 to 57 percent in 2016. The percentage of employees who reported having a colonoscopy increased from 28 percent in 2014 to 35 percent in 2016. The percentage of employees who reported having a Pap test increased from 64 percent in 2014 to 67 percent in 2016. The percentage of employees who reporting having a mammogram increased from 39 percent in 204 to 47 percent in 2016. There are still several opportunities for employees to “Know Your Numbers” and earn an Emory medical plan incentive of $150. Learn more.